Home Tags Posts tagged with "how’s nick cannon?" Mariah Carey revealed her husband Nick Cannon has been rushed to hospital in Aspen, Colorado, after suffering from kidney failure. Despite Mariah Carey urging their fans to “pray for Nick”, she doesn’t look too fearful about his health given her Twitter activity. 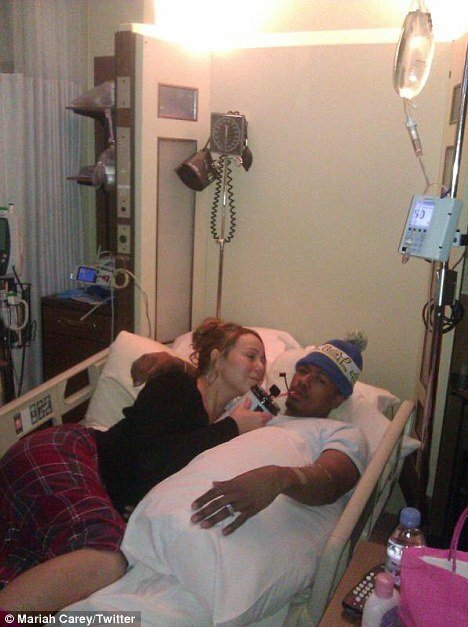 Mariah Carey, 41, bizarrely posted a photo of herself posing beside an ailing Nick Cannon, 31, in his hospital bed. The couple are clearly optimistic he will recover, with Mariah Carey describing his kidney failure as “mild”. She posted news of Nick Cannon’s illness in the early hours of this morning. Mariah Carey then wrote a more detailed description of his medical drama on her official website. “This is us in the hospital – role reversal; Last year it was me attached to the machines (after having dembabies) and Nick was there with me through it, and now here we are. “We’re trying to be as festive as possible under the circumstances but please keep Nick in your thoughts because this is very painful. They tried to kick me out of the hospital but here I am pon de bed with Mr. C.
“We’re doing OK but we’re <<straaaaaanded in Aspen>>. #DramaticDivaPlace (I know, we could be in a lot worse places) but the truth is as long as we’re together, we’re OK.
Mariah Carey and Nick Cannon have been spending the Christmas and New Year period in Aspen with their twins Moroccan and Monroe. Nick Cannon’s hospitalization perhaps explains why the couple haven’t been photographed out and about in Aspen since New Year’s Eve.